Venezuela's Maduro Wins Boycotted Elections Amid Charges Of Fraud : The Two-Way NPR's Philip Reeves, reporting from Caracas, says many voting stations around the capital were nearly empty despite the government's claim of a nearly 50 percent turnout. Venezuela's President Nicolás Maduro and his wife, Cilia Flores, wave to supporters at the presidential palace in Caracas on Sunday after election officials declared his victory. As NPR's Philip Reeves reports from Caracas, "Throughout the day voting stations appeared almost empty around the capital." Despite that, election officials claim turnout of nearly 50 percent. "The process undoubtedly lacks legitimacy and as such we do not recognize it," said Falcon, a 56-year-old former state governor. According to The Associated Press, "Falcon was joined in his call for a new election by third-place finisher Javier Bertucci, who got around 11 percent of the vote. Bertucci, a TV evangelist, stopped short of challenging the results, saying what he called a mistaken opposition boycott also boosted Maduro." "Falcon, a former member of the Socialist Party who went over to the opposition in 2010, said he was outraged at the government's placing of nearly 13,000 pro-government stands called "red spots" close to polling stations nationwide. The "fatherland cards" are required to receive benefits including food boxes and money transfers." 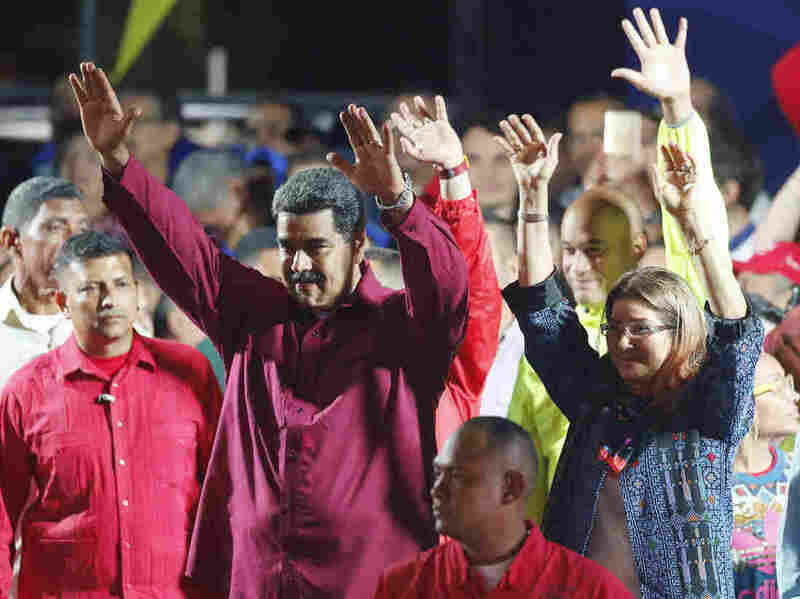 In the run-up to the election, Freedom House issued a statement calling it "clearly unconstitutional" and called Maduro a "dictator" who has crushed all opposition. As voting took place on Sunday, a senior State Department official warned that the U.S. might press ahead on threats of imposing crippling oil sanctions, according to the AP. An earlier version of this story misspelled Venezuelan President Nicolás Maduro's name as Nicholas Maduro.